Lady Gaga has reportedly been approached by Disney about taking on the role of Ursula in their live-action adaptation of The Little Mermaid. The popstar has recently been getting high marks for her performance in Bradley Cooper's A Star is Born, which is now in theaters. Gaga previously showed off her acting chops in American Horror Story: Hotel and received praise from fans as well as critics for her portrayal of The Countess / Elizabeth Johnson. Getting a role in a Disney project could be the perfect fit for the musician. Though Disney has declined to comment, it's believed that the they want Lady Gaga to play Ursula in the live-action adaptation of The Little Mermaid. However, it was also rumored that the popstar was offered a role in the DCEU's Birds of Prey, but she turned it down. 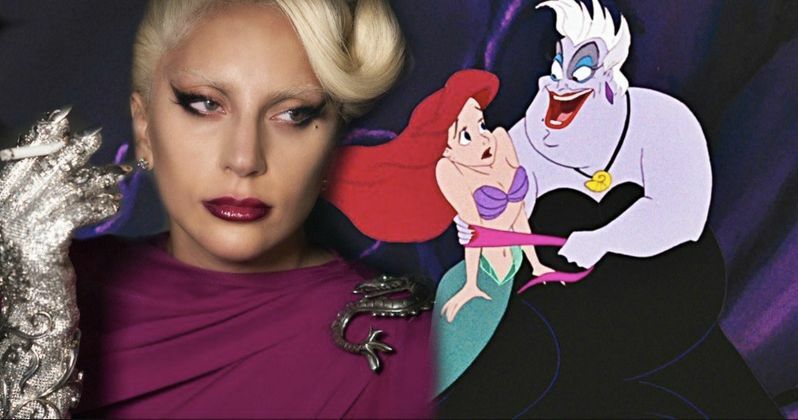 Will Gaga want to take on the role of the villain in a Disney film? That remains to be seen, but she could definitely bring an over-the-top performance as Ursula with an already awesome singing voice to match. Lady Gaga might be the best casting choice for said role, so let's hope that it ends up happening. Disney has been on a roll with their live-action adaptations of their classic films. Jon Favreau took on The Jungle Book and Bill Condon helmed Beauty and the Beast, which was a massive success at the box office. The studio is currently working on bringing Aladdin, The Lion King, and Mulan to the big screen, with Lady and the Tramp planned for Disney's new streaming service. The Little Mermaid live-action movie has been in development for quite some time and seems that it might be one of the more ambitious adaptations in terms of filming and creating an underwater world. In addition to Lady Gaga potentially joining the cast of the live-action adaptation of The Little Mermaid, Disney star Zendaya has reportedly been offered the lead role of Ariel. The news was revealed in August of this year, but neither the studio nor the young actress have commented on the reports. With that being said, The Little Mermaid could end up being one of the more popular live-action adaptations for the studio, especially with Mary Poppins Returns director Rob Marshall on board to direct the project. While The Little Mermaid live-action movie has been talked about for several years, we've yet to see a whole lot of official news. Alan Menken and Lin-Manuel Miranda will team up to compose the music for the film and production is expected to begin filming in Puerto Rico and Cape Town Africa soon. More news about the project should be revealed before the end of the year. Lady Gaga and Zendaya taking on one of Disney's most beloved classics would certainly be huge for Disney. The potential casting news for The Little Mermaid live-action movie was first reported by The Dis Insider.